What is it like to be with a person who has the exact same name as you? It’s not easy to have the same name as someone else. 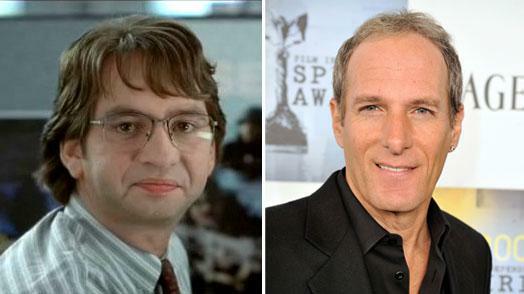 Just ask Michael Bolton from Office Space, who does not celebrate the entire catalog of musician Michael Bolton. We were both computer science majors. We have similar height, build, and color. We were both from the same state (Haryana). In IITs, it is common to name people after their joint entrance examination (JEE) rank. He was rank 6. However I was rank 6 in All India Engineering Entrace Exam (AIEEE), and so this too wasn’t that clear of a marker. We are very good friends and virtually hung out together all the time while in college. Now he is working with Google, and I’m working with Quora, and we’re roommates again! Our friend circle is pretty much common. None of our friends calls us by our real names, but only by our nicknames, and that solves the issue to some extent. However, while communicating with all people who don’t know or use our nick names, we face a huge problem. My official name in college was only Nikhil and his was Nikhil Garg. In my freshman year, I received a huge scholarship that sponsored my tuition fee for all four years of college. And since the cheque was for Nikhil Garg, college authorities put money in his bank account. I was asked to prove that it was me who had got the scholarship, and believe me, that wasn’t easy. During my junior year, I got an internship offer from Microsoft Research. Placement cell people forwarded the offer to his profile (when he hadn’t even interviewed with them). During campus placements, Google had come for a written test. He got through the test, and I didn’t. This came as a shock because my test had gone really well, and he wasn’t so confident about his. As soon as I told him that I hadn’t gone through, he lost his hope and decided that it’d be a mistake because of common names. Though eventually, after we got it checked, we found that the initial results were correct. Some days ago, we took a road trip to Vegas. He was on the driver’s seat and was going over the speed limit. We got pulled over by a cop who demanded his driving license. Now we both had temporary licenses, which didn’t have our photographs on the first page. Further, they were in the same pocket of the same bag. We were little panicked anyway, so we just reached out to the pocket and gave him a license. Cop issued a court notice on the same. An hour later, we realized that it was mine and not his. So I had a court notice for speeding without having driven a mile in the U.S.
We deal with same bank, same renter insurance, same auto insurance, etc., and we can’t distinguish our mail! It’s common for our friends to IM me when they meant to IM him and the other way around. All in all, there is a definite identity crisis, but all this confusion eventually turns into interesting stories and delightful memories. What names have negative meanings? What are some of the worst baby names? Do you use a different name at Starbucks? If so, why?